The bottom line with the Trans-Pacific Partnership for Canada is that it really doesn't have a choice about whether or not to join. The Americans and Mexicans are joining and they're taking the North American market i.e. Canada's market, the source of its prosperity, with them -- whether or not Canada agrees. 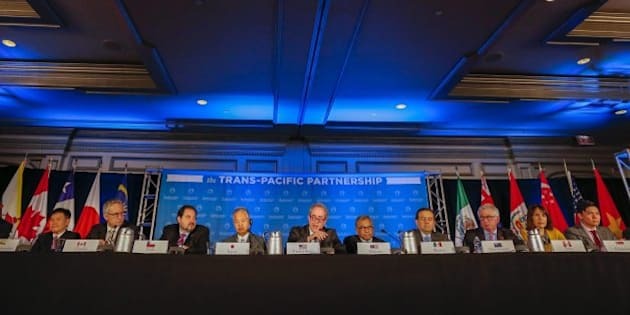 The TPP will turn North America from a privileged table for three, which Canada has more or less had to share only with Mexico, into a crowded sauve qui peut la vie table for 12. The bottom line with the TPP for Canada is that it really doesn't have a choice about whether or not to join. The Americans and Mexicans are joining and they're taking the North American market i.e. Canada's market, the source of its prosperity, with them -- whether or not Canada agrees. The TPP will turn North America from a privileged table for three, which Canada has more or less had to share only with Mexico, into a crowded sauve qui peut la vie table for 12. Given how much Canada complained when North America went from a table for two to a table for three when Mexico joined, and given how poorly Canada handled that change -- looking nostalgically backward instead of finding the new opportunities -- the move to a table for 12 does not bode well. But again, Canada really doesn't have a choice. Even if Canada decides not to join the TPP, the destination for 81 per cent of the country's exports, that won't change the reality of North America or NAFTA, getting nine new players around the table, most of whom are a lot hungrier than was Mexico when it joined NAFTA two decades ago. If Canada does not join the TPP these nine TPP countries will still get privileged access to the North American market and in return Canada gets... well, jack all. If Canada does join the TPP it will at least get (better) access to these other nine markets and get it now. Canada could always "rip up the agreement" decline to join, see its competitors the Americans, Chileans, Australians and Kiwis benefit and then petition to join. Seems an expensive and silly waste of time and opportunity. A harder truth is that even if Canada manages to survive this upheaval and hold on to some market share in North America, that's not the end of the story. The bigger problem will be the crowded table itself. Trying to get the attention of the Americans on issues of importance to Canada have been increasing difficult. With 12 countries inside of a new NAFTA, it gets harder still. And the truths get harder. Not too far down the road Canada's struggles will not just, or even primarily, be about goods and products; it's more about the booming new world of trade in services. Canada has been so focused on dairy and autos that no one is really talking about trade in services -- banking, insurance, oil production, bio-science, engineering, mining supply. Demand for these commodities will grow with the rise of the global middle class and billions of new consumers for commodities that Canada produces, very well and extremely efficiently. But billions of new consumers is more demand than Canada can meet, which means others are going to have to produce as well. Most of these other folks don't produce as well or as efficiently as does Canada -- or the U.S. or Australia. Providing the technology, the skills, the training the management, or services associated with producing these commodities will be a huge market. But only for countries that start thinking about trade in services the same way they think about autos. And for Canada that starts with the TPP. With Australia though, it arguably started when they stopped subsidizing automobile production and waved goodbye as the industry left leaving the country free to focus on sectors where it had real competitive advantage. Australia and Canada are similar in many regards, both are world leaders in manufacturing extractive and commodity production equipment. Canada, and its manufacturing in central Canada, had best hope the Aussies hasn't moved their attention and subsidies to manufacturing extractive equipment. And, the Aussies have been thinking about these sorts of issues as evinced by the wonderful and wonderfully titled paper "The puck stops here! Canada challenges Australia's grain supply chains." Or maybe not so wonderful for western Canada. And finally, speaking of hard truths, Canada needs to start speaking them. Yes, jobs are going to be lost; there will be pain. All healthy economies have creation and destruction. But Canada will only gain jobs if it manages to avoid repeating the mistakes it made when Mexico joined NAFTA. Instead of seeing Mexico's economy growing to become larger than Canada's, instead of seeing the growth of Mexico's middle class and the demand it would create, Canada complained and continues to complain about having to share the U.S. market with Mexico. Some companies like Scotiabank, Bombardier and ATCO have done well. But more opportunities seem to have been missed. Canada is the sixth largest exporter of softwood lumber to Mexico after the U.S., which is understandable and also after Chile which is also understandable given that the two countries have a trade agreement. But Canada also falls behind Brazil (Brazil!!) and other countries that do not have trade agreements with Mexico not to mention being much, further away and not connected by rail lines. If Canada can't pick up easy business inside of a three-country NAFTA how is it going to do in a 12 country NAFTA, aka the TPP? Canada is about to find out regardless of what it feels or does about the TPP. But there are opportunities. Canada can start getting out ahead of these issues. The government missed an opportunity to join the TPP talks years ago before the Americans joined. And that has cost us. The government also missed an opportunity to join the Pacific Alliance trade integration group. The country managed to survive these missteps but maybe that hasn't been such a good thing as we now here supposedly serious questions about whether Canada should join the TPP. A repeat of Canada's experience with NAFTA would be disastrous as this time it's not just Mexico around the table. The coming of the agreement, in 11 if not 12 countries, is a wake up call; one Canada should have heard years, if not decades, ago. But, it's not too late.